For the customer, silos create a contradiction where each channel seems like a whole other organisation. This inconsistent experience includes a difference in the tone of voice; duplication of messaging; or having to start the conversation again every time it shifts to a fresh channel. The groundwork required is a full and total immersion in customer behaviour, frustrations, experiences and feedback to fully understand their needs and what unique value you can bring to them. By capturing location, demographic and social data you can propose a personalised customer experience. The end goal should be to drive insight from all of your data and seamlessly orchestrate, automate and feed it into your channels. 6:00 – Alexa alarm goes off citing aloud your daily journey/ commute, any delays, alternative routes and diary bookings. It can get annoying but creates the necessary sense of urgency to get up! 6:35 – You’re off for a morning run where your smartwatch provides weather conditions and health goals. 7:20 – In the shower, you set temperature controls and pick music playlist options using voice recognition. 8:00 – Your aggregated view of multiple bank account balances is displayed on the fridge touch screen with options to repeat a grocery store order based on identified needs via sensors. Ecommerce payment is directly routed to the supermarket – an open banking partner of your bank that you had previously activated through the Marketplace. All this while you eat breakfast. 8:15 – You check and choose personalised vouchers and offers to redeem instantly as part of your online grocery purchases. All payments are completed with any discount entitlements included! 9:00 – Through face recognition, access is granted to your office building and available hot desks or booths to book are pushed to your smartwatch as you approach the work area. You choose and activate the desired one. 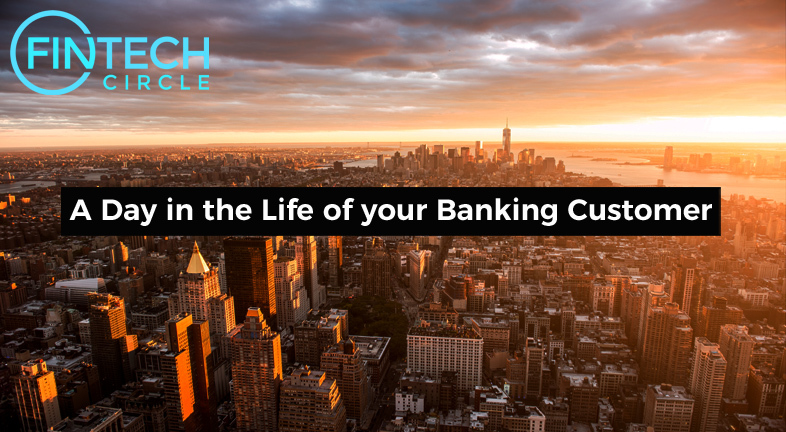 10:00 – You get an aggregated view of your business accounts across all banks including a real-time cash-flow calculation. 13:00 – You meet associates for business lunch at a pre-booked partner restaurant (yeap – picked it through the Open Banking Marketplace). An actionable push notification is received and upon approval the payment gets processed using your predefined corporate card (mobile wallet engine). The claim is submitted through deep linking into your accounting system [open banking integration with ERP system]. Super-efficient! 15:10 – Your driverless taxi picks up the kids according to your scheduled booking and payment is triggered as they arrive at your house (destination). Throughout the journey, you can monitor via an app the duration and any traffic delays. A notification is sent to you confirming that they were dropped off safely. 17:20 – You call your banking advisor via video integrated into your mobile banking app. She updates your investments portfolio and discusses business lending options with you. That’s saved you a whole trip to the branch – yay, escaped the rush hour and no queuing! 22:30 – You review your aggregated lifestyle dashboard for a summarised view of your day’s activities and goals: Diary, health, family, errands, finances, business/career. All in check! Awesome day; off to bed.